You cannot safely home can bread or cake. 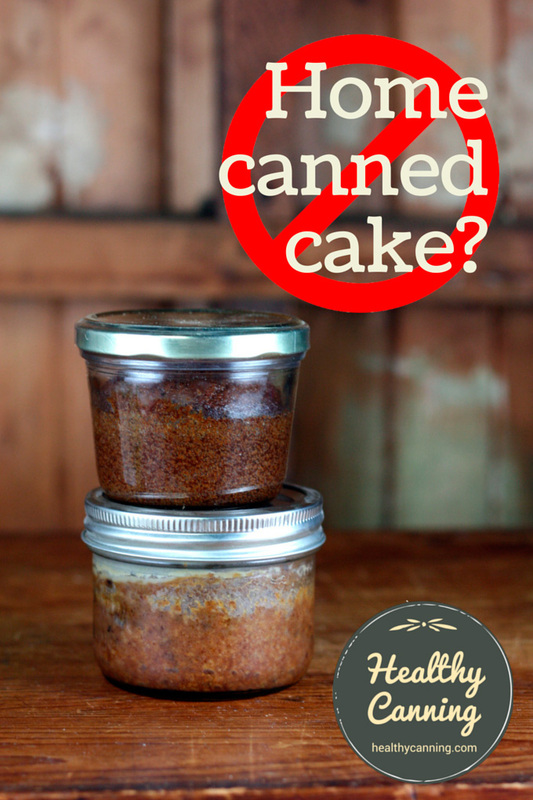 If someone gives you home canned cake, assume it is unsafe to eat and discard it in a manner that not even animals can consume it. See the USDA’s procedure for handling suspect food. What is cake in a jar? 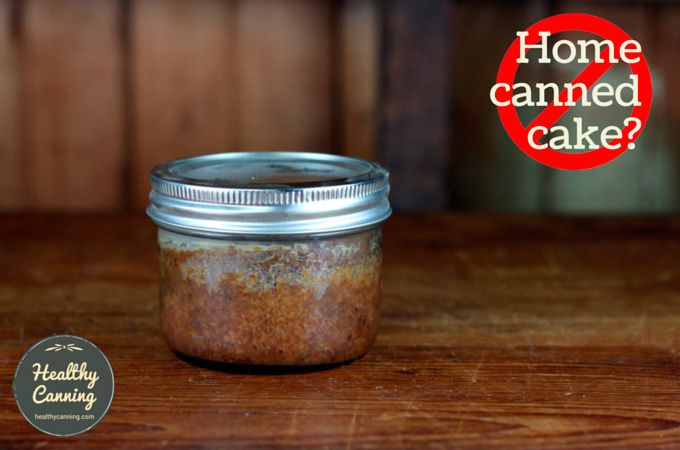 “Home-canned cakes” and “home-canned quick breads” are cakes or quick-breads that have been baked in, and then sealed in, a jar with a lid. In making them, cake batter is poured into canning jars, which are then baked in the oven. When the cake is deemed cooked by the cook, the jars are taken out of the oven, metal lids slapped on right away, and as the cake and jar cools a vacuum (usually) forms, creating a sealed jar. 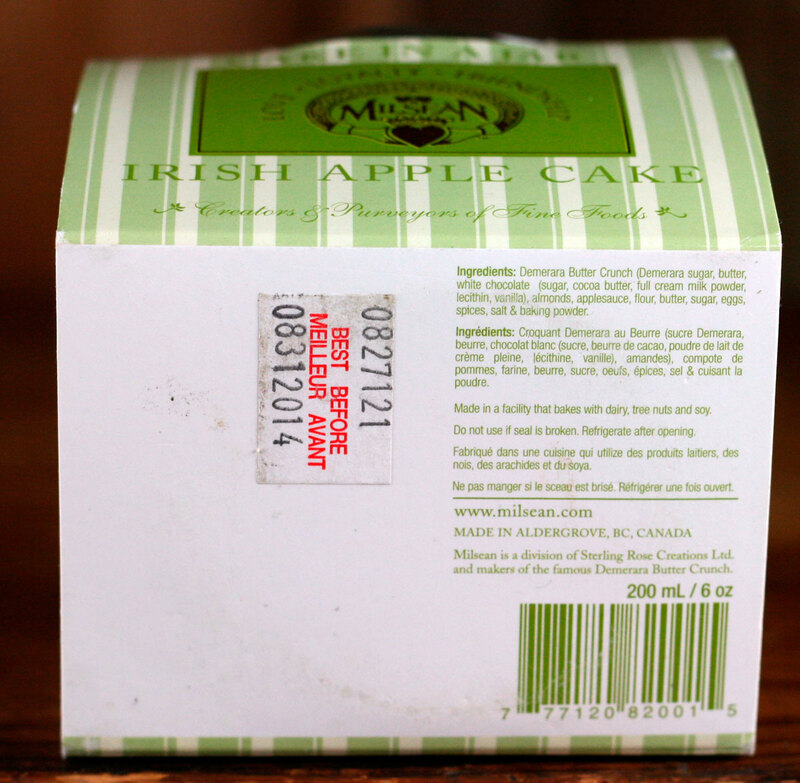 Recipes maintain that the cake is shelf-stable and can be stored anywhere from a year to indefinitely. The first thing to note is that this isn’t actually “home-canned” cake, because there isn’t actually any canning that happens. So they don’t actually undergo a canning process, which is heat-treatment of a canister of some sort holding food. You may also see commercially-made and sold ones in stores. 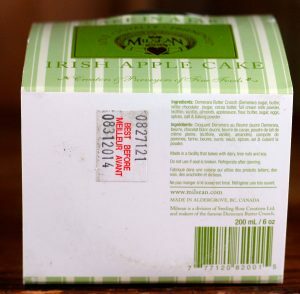 The commercially made “cakes in a jar” that are sold without sealed tops, and kept refrigerated in chillers, are fine, and there is no question of concern about those, beyond the usual best-before dates. The shelf-stable ones made by large food companies and sold in grocery stores are also considered fine: they will have added rafts of preservatives and additives only available commercially to make it safe. You will see these products made commercially; however additives, preservatives and processing controls not available for home recipes are used.”  Andress, Elizabeth L. and Judy A. Harrison. So Easy to Preserve. University of Georgia Cooperative Extension. Bulletin 989. Sixth Edition. 2014. Page 117. 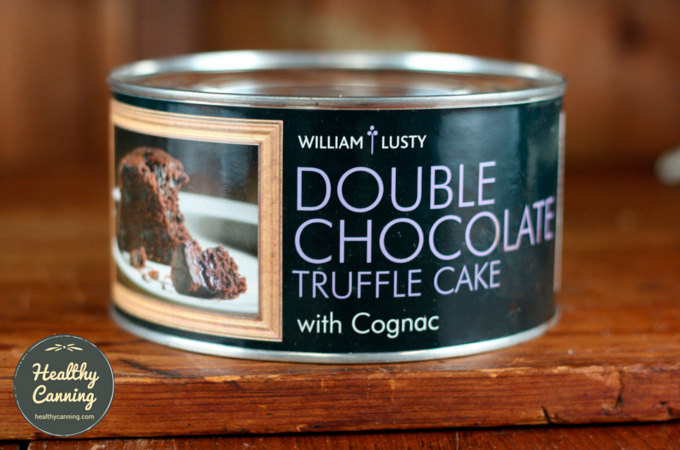 Cake commercially canned by a large professional food company. If you don’t see preservatives on the list of ingredients, then, it’s possible that it was a combination of process control and strictly regimented recipe formulation that made them safe. Or, you may want to avoid these as well all together. Sample shelf-stable commercial cake in a jar ingredients. No preservatives are present so presumably safety was achieved through formulation and process controls. Click to enlarge. The risk is the big B word — botulism. These products present the risk of food poisoning from botulism toxin.”  Ingham, Barb. Canned Breads and Cakes an Unsafe Holiday Gift. Blog posting. 10 November 2017. Accessed November 2017 at https://fyi.uwex.edu/safepreserving/2017/11/10/canned-breads-and-cakes-an-unsafe-holiday-gift/. Some research studies have shown that low acid canned bread or cake products may have characteristics that are favorable for growth of Clostridium spores.”  Penn State University Extension. Canned Breads and Cakes. Accessed July 2016. Remember, several strains of botulism are invisible. Foods spoiled by other bacteria are friendly by comparison, because your eyes and common sense will tell you not to eat them. You don’t get that warning with botulism infested foods. They can look, smell and taste fine. To date, there are as of yet no documented cases of botulism resulting from cake in a jar. But again, all the experts are warning it’s an accident waiting to happen. Imagine how you would feel if you were the one who made the home canned cake in a jar that made someone incapacitated for life, or worse. 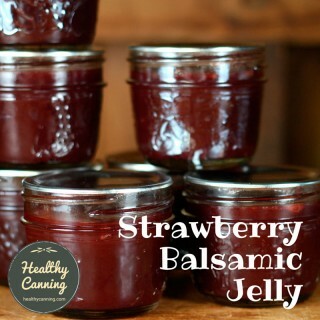 What if you don’t seal the jars, but rather just bake your homemade treat in a canning jar, then store it in a fridge? Don’t even mention that to Ball or Bernardin. They have a bird when you mention baking in their jars. Their jars are made of annealed glass, not Pyrex. 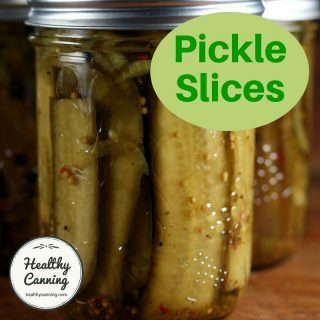 The jars are certified for moist heat achieved from canning using boiling water, steam or pressure canning, not for dry oven heat, and they may fracture, shatter or explode in an oven, or be weakened enough that they will inexplicably shatter in someone’s hands later. We do not recommend baking in any size or shape of Ball or Kerr canning jars. The glass used for Ball and Kerr canning jars is not tempered for oven use and is not meant to be used as bakeware.”  Ball. FAQ. Accessed July 2016. Some of the refrigerated commercial ones you buy have directions on them asking you to heat them up (with metal lid off) in the microwave. It’s unclear what Ball or Bernardin would say about microwave use of their jars, either. Directions indicating cake in a Bernardin mason jar to be heated in microwave. It’s unclear what Bernardin’s stance on that would be. Click to enlarge. Penn State Extension gives this advice (citing Dr Angie Fraser from North Carolina State). 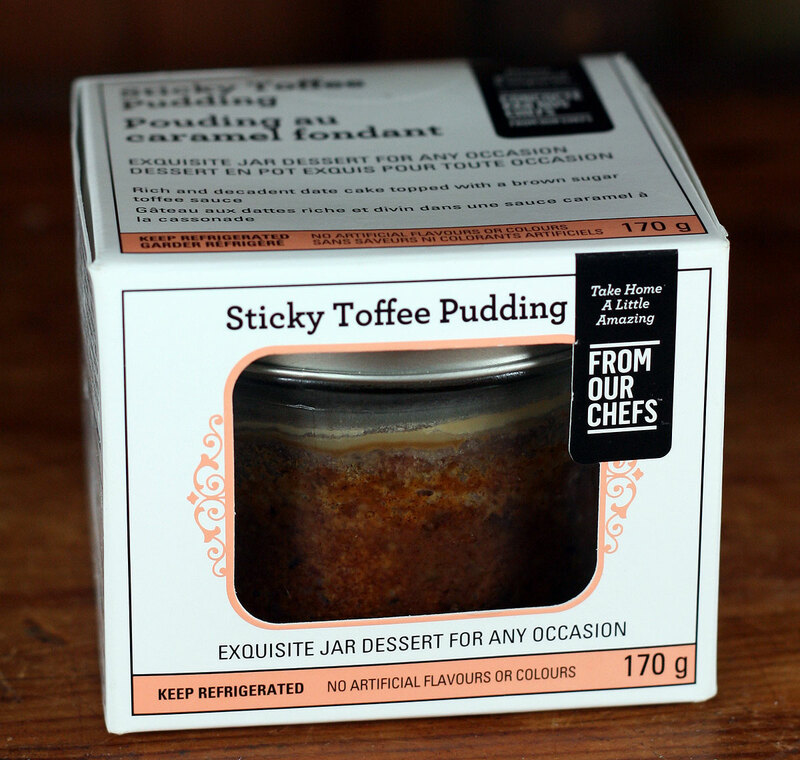 They basically say that if you really are bound and determined to give cake in a jar as a present, make sure there is no vacuum seal on the jar, and give it as a refrigerated product. They note that regardless, there’s a risk of having the jars crack in the oven during baking. You would want to make sure that the recipient knows what the shelf life is, and, that it does need to be kept refrigerated. This could apply to people with an empty jar and a lid, and thinking that that makes everything look like it should be sealed inside that jar. 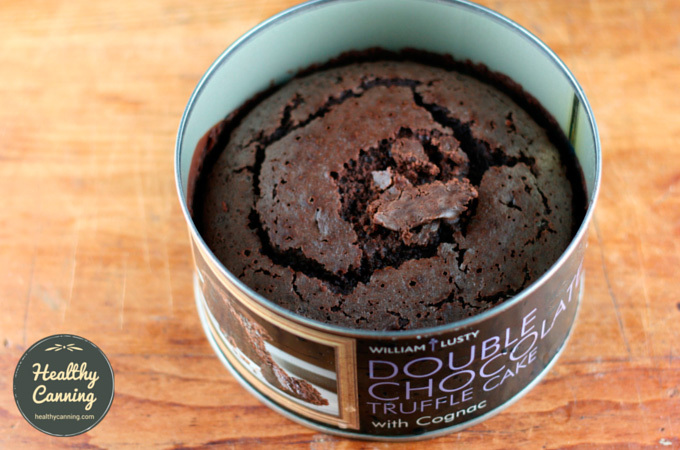 A sealed jar at room temperature is not the right storage method for cake or bread. Instead, consume these items fresh, or frozen. Charlotte Brennand from Utah State agrees: enjoy it fresh, or freeze it. ….prepare the ingredients of the cake or bread as a ‘mix in a jar.’ Layer the dry ingredients for a quick bread or cake into a jar and attach the directions for baking it to the outside. 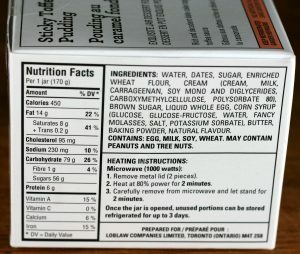 Include a ‘use by’ date on the label because ingredients such as baking powder will lose their effectiveness over time; brown sugar will harden when combined with other ingredients, and moisture from nuts and raisins can cause dry ingredients to cake. Ingredients for a topping, as on a coffee cake, can be inserted into a small plastic bag and placed on top of the other dry ingredients. One month from the time you prepare a ‘mix in a jar’ is an appropriate ‘use by’ date.”  Clemson University Extension Service. Cakes and Breads in Jars – Are They Safe?Accessed July 2016. 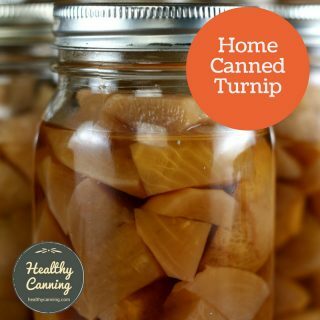 To be clear: As with all historical research presented by HealthyCanning, none of the recipes or recommendations in this section are to be followed. The information here is for academic background purposes only. Two newspaper columnists refer to the cake in a jar concept being a creation of Penn State University during World War Two. Baking quick breads in canning jars as a means of preservation was common during World War II. Interest in this process has recently been revived.”  Calvillo, Vivian. 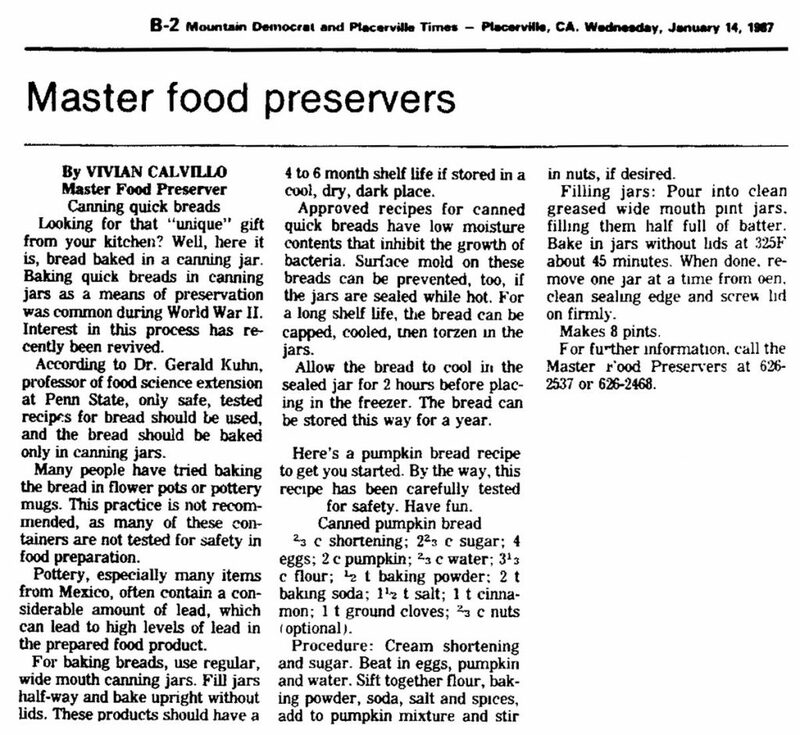 Master Food Preservers Column. In: Placerville Mountain Democrat. Placerville, California. 14 January 1987. Page B-2. 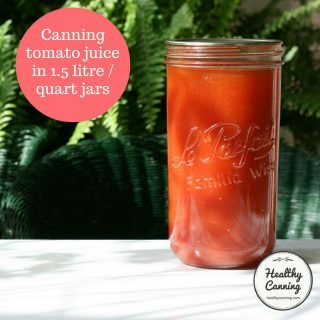 HealthyCanning has been unable to date (2016) to find any primary source material which would back their assertions about a World War Two origin. Calvillo, Vivian. Master Food Preservers Column. In: Placerville Mountain Democrat. Placerville, California. 14 January 1987. Page B-2. Click to enlarge. 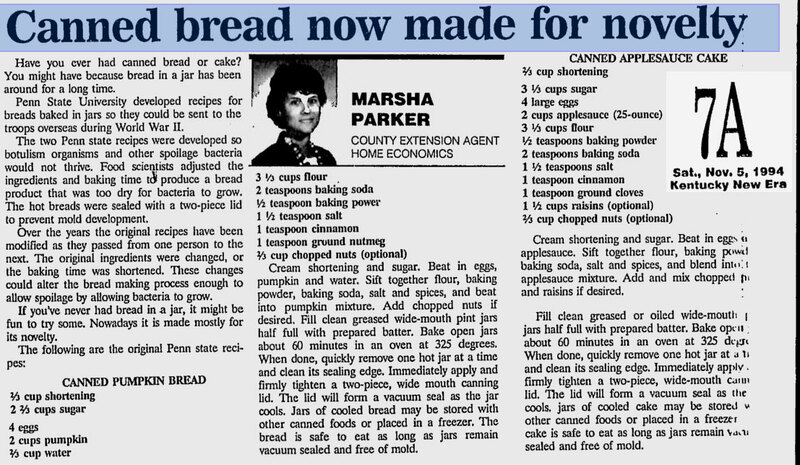 Marsha Parker asserted in 1994 that in the years since the war, the recipes had been altered by being passed from one person to another, which could make them unsafe, and thus she was running the two Penn State originals: Pumpkin Bread, and Applesauce Cake. Parker, Marsha. Canned bread now made for novelty. Hopkinsville, Kentucky: Kentucky New Era. 5 November 1994. Page 7A. Click to enlarge. Some people instead attribute the recipes to Gerald Kuhn. “It was developed by Gerald Kuhn, retired professor of food science at Penn State.” Martinson, Suzanne. Canned Pumpkin Bread. Post Gazette, Pittsburgh, Pennsylvania. 10 November 2002. Several years ago, a professor of Food Science at Penn State developed a recipe for canned bread. It was carefully formulated so that acid and moisture levels would prevent the growth of Clostridium botulinum spores during room temperature storage. The product can be safely made as long as the original Penn State recipe is followed exactly as written.” Penn State University Extension. Canned Breads and Cakes. Accessed July 2016. This does not say it was actually Gerald Kuhn. Nor have we have able to find a primary source copy of such a recipe to compare it with what appeared in the newspaper clippings above. So we have been unable to verify the World War Two story, unable to confirm a Gerald Kuhn origin, and unable to find an actual Penn State issued copy of such a recipe. So we are not in possession of a clear chain of evidence that what appeared in the newspapers, warning people not to deviate, didn’t deviate itself. 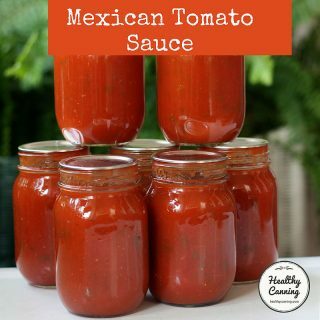 In any event, the idea was that the two recipes had the right finely-balanced combination of acidity and low water activity that would be safe baked in jars (aside from the safety factor of the glass jars themselves in the oven) and then sealed in them. The recipes have since been retracted. It was apparently decided that the risk was too great that home cooks would not follow the recipe rigorously: that they’d make substitutions, make mis-measurements over or under, forget something, or, try to be creative. However, there is a significant risk that the creative cook may make ingredient substitutions or omissions that could significantly change the pH of the product such that conditions might be more favorable for growth of Clostridium spores.” [ref]Penn State University Extension. Canned Breads and Cakes. Accessed July 2016. In 1994, researchers at Kansas State University tested a banana-nut bread recipe. So that’s why the recipes were withdrawn. There was just too great a risk that home cooks would deviate, on purpose or by accident, and, research work showed there could easily be bacterial growth in deviations occurred or other recipes were tried. Aramouni, F.M., Kone, K.K., Craig, J.A. and Fung, D.Y.C. (1994). Growth of Clostridium sporogenes PA 3679 in Home-Style Canned Quick Breads. Jn. of Food Protection 57(10):882-886. 4. ↑ Andress, Elizabeth L. and Judy A. Harrison. So Easy to Preserve. University of Georgia Cooperative Extension. Bulletin 989. Sixth Edition. 2014. Page 117. 5. ↑ Ingham, Barb. Canned Breads and Cakes an Unsafe Holiday Gift. Blog posting. 10 November 2017. Accessed November 2017 at https://fyi.uwex.edu/safepreserving/2017/11/10/canned-breads-and-cakes-an-unsafe-holiday-gift/. 6. ↑ Penn State University Extension. Canned Breads and Cakes. Accessed July 2016. 9. ↑ Ball. FAQ. Accessed July 2016. ….prepare the ingredients of the cake or bread as a ‘mix in a jar.’ Layer the dry ingredients for a quick bread or cake into a jar and attach the directions for baking it to the outside. 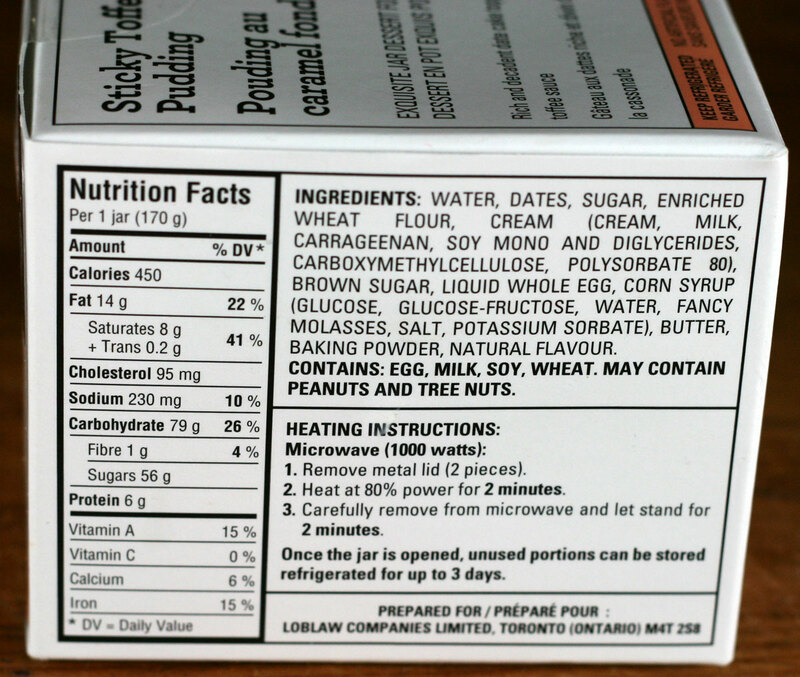 Include a ‘use by’ date on the label because ingredients such as baking powder will lose their effectiveness over time; brown sugar will harden when combined with other ingredients, and moisture from nuts and raisins can cause dry ingredients to cake. Ingredients for a topping, as on a coffee cake, can be inserted into a small plastic bag and placed on top of the other dry ingredients. One month from the time you prepare a ‘mix in a jar’ is an appropriate ‘use by’ date.” [ref] Clemson University Extension Service. 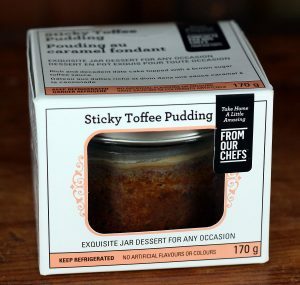 Cakes and Breads in Jars – Are They Safe?Accessed July 2016. 15. ↑ Clemson University Extension Service. Cakes and Breads in Jars – Are They Safe?Accessed July 2016. Baking quick breads in canning jars as a means of preservation was common during World War II. Interest in this process has recently been revived.” [ref] Calvillo, Vivian. Master Food Preservers Column. In: Placerville Mountain Democrat. Placerville, California. 14 January 1987. Page B-2. 16. ↑ Calvillo, Vivian. Master Food Preservers Column. In: Placerville Mountain Democrat. Placerville, California. 14 January 1987. Page B-2. Some people instead attribute the recipes to Gerald Kuhn. “It was developed by Gerald Kuhn, retired professor of food science at Penn State.” [ref]Martinson, Suzanne. Canned Pumpkin Bread. Post Gazette, Pittsburgh, Pennsylvania. 10 November 2002. 18. ↑ Martinson, Suzanne. Canned Pumpkin Bread. Post Gazette, Pittsburgh, Pennsylvania. 10 November 2002. Several years ago, a professor of Food Science at Penn State developed a recipe for canned bread. It was carefully formulated so that acid and moisture levels would prevent the growth of Clostridium botulinum spores during room temperature storage. The product can be safely made as long as the original Penn State recipe is followed exactly as written.” [ref]Penn State University Extension. Canned Breads and Cakes. Accessed July 2016. 19. ↑ Penn State University Extension. Canned Breads and Cakes. Accessed July 2016.